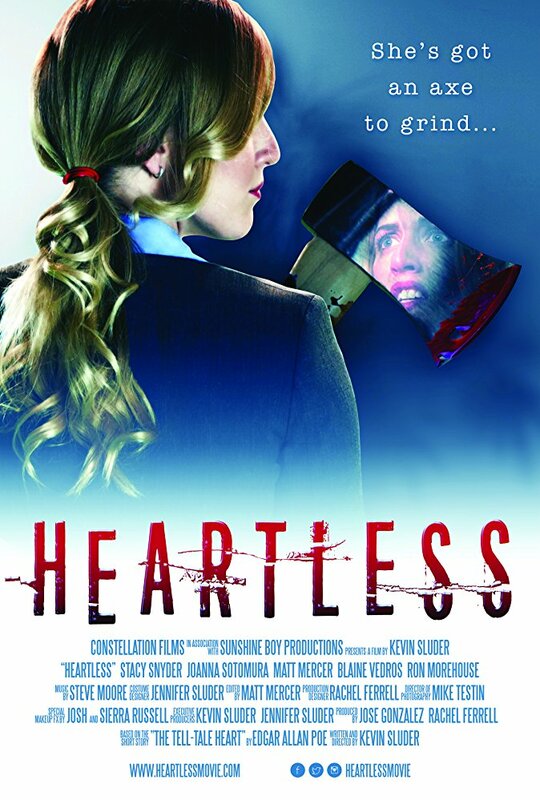 John’s Horror Corner: Heartless (2018), Independent Short Film Review. MY CALL: Edgar Allan Poe’s “Tell-Tale Heart” meets American Psycho (2000) and Mayhem (2017) in this very promising gory office horror short film. MORE Indie Reviews by MFF: We occasionally do solicited horror short film and pre-release indie film reviews on request. Among recent solicited promotions are Love in the Time of Monsters (2014; feature length), Interior (2014; feature length), Smothered (2014; feature length), In the Dark (2015; feature length), Brother (2016; short), Other Halves (2016; feature length), Scythe (2016; short), The Belko Experiment (2016; feature film, mainstream theatrical release), The Barn (2016; feature length), Shallow Waters (2017; short), Burn (2017; short), Tethered (2017; short), We Love Selfies (2017; short), Cool (2017; short), Girls Night (2017; short), Because Reasons (2017; short) and Remnants (2017; short). Disclaimer: This review was solicited by the filmmakers and/or producers who provided privileged access, directed us to a viewing medium, and/or offered permission to use image stills of the film. However, my opinion remains unbiased as I was neither hired nor paid to produce this critical review, nor do I have an investment stake in the film. Inspired by The Tell-Tale Heart, Short Film Heartless made its World Premiere at the Oxford Film Festival. The directorial debut short film from the award-winning production company Sunshine Boy Productions. IMDB Summary: “Based on Edgar Allan Poe’s ‘The Tell-Tale Heart,’ an overlooked associate struggles to complete a corporate presentation as a horrific secret gnaws at her conscience.” Here’s the IMDB page. In the wake of recent “office horror” sensations as The Belko Experiment (2016) and Mayhem (2017), Heartless rolls out sharply bantered sexism eliciting a half-taken-aback smirk and a shockingly abrupt turn to violence leaving my mouth grinningly open and my eyes wide. I mean, who has even seen someone get “punched” in the face with a coffee mug? Or seen a throat slit with one? Points for originality! I really dig the storytelling style here, as we yo-yo between Shelby’s (Stacy Snyder; Abandoned Dead) business presentation, her mocking An American Werewolf in London-esque hauntings of her dead colleague, and flashbacks to the night she killed her colleague Clare (Joanna Sotomura; Madison County, Contracted: Phase II). 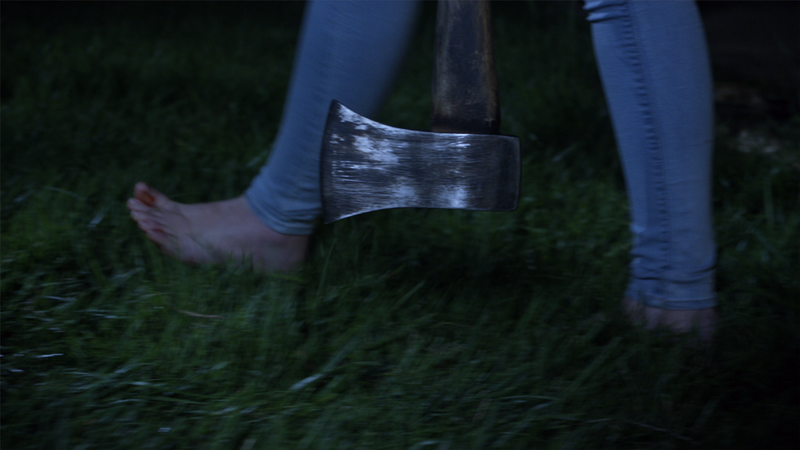 For a short film, the gore was surprisingly good, abundant, well-executed and varied. And the humor behind the delivery—especially after the eye-stabbing—does kindly liken this to the psychologically distorted Mayhem (2017) or satirical stylings American Psycho (2000). Not only that, but the sound editing/mixing with the gore (e.g., the sloshy goopy sounds accompanying the dismemberment) was top notch. I was also quite fond of the three over-bro’d power-douchebags a la modern American Psycho (2000)—Matt Mercer (Madison County, Contracted I-II, Beyond the Gates) among them, who also did the editing for this film. More than a short…? I question the notion of expanding this to a 90-minute feature—but, I also haven’t been handed a script LOL. However, I’d love to see this fully realized as a 30-minute installment to a perhaps office/corporate-themed horror anthology. In fact, Heartless could almost be the wrap-around story (the presentation) and Clare’s death could be one of the vignettes. 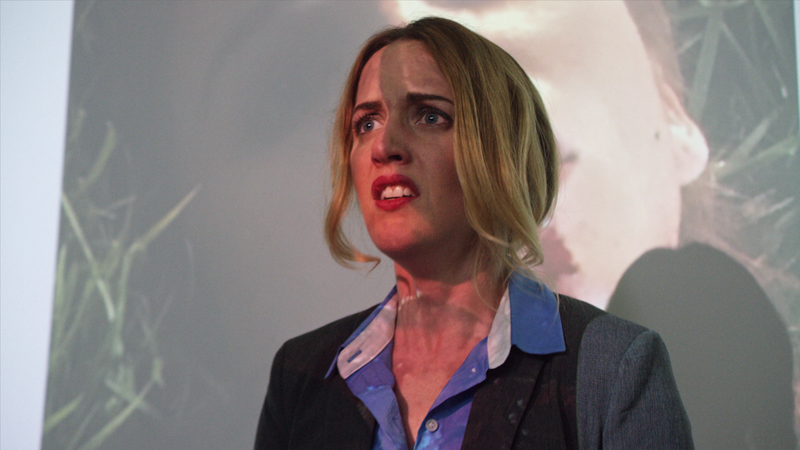 Director Kevin Sluder does a solid job of showcasing his ideas and his story-telling prowess (a skill lost upon most horror creators), and his cast does honor to the somewhat caricatured office and gender roles while drawing satirical smiles. What’s more is that every member of the cast (and thus every character written) brought something valuable to the film… that’s rare whether assessing short films or features. But what impresses me most is that whereas Heartless’ cast is experienced at acting, our director (Sluder) is not experienced at directing. This is his first time helming a project and, you know what, he nailed it! Perhaps he owes some of that to his actors, but maybe they likewise owe some of their success to him. Clearly, they all formed a great team. And cheers to the editors as well! Excellent pacing with the cuts between past/present timelines and Shelby’s hallucinations. Overall, one of my better indie review experiences in the last year along with Burn (2017), Tethered (2017), Cool (2017) and Remnants (2017). ← John’s Horror Corner: Veronica (2017), an underwhelming Spanish film based on the true story of a Ouija séance-gone-wrong.